Once upon a time, I suddenly started getting yellowing/bleaching from the veins on new growth during veg. I'm still getting it. Furthermore, my vegging plants effectively aren't drinking or growing at all. My temps are fine (70-77f), my pH in and out seems within sane range, RH is on the low side (40%-50%) but not extreme (and still higher than it was in winter). As for soil, I've got a few different ones going trying to identify a reason for my problems. For all of them, drainage is good -- maybe almost too good? When I feed/water, I get run-off in less than a minute, even with small quantities of water. For example, when I watered yesterday (after no watering for 8-12 days, depending on the plant), I only gave 250mL/ea for a 1-gallon pot, and probably about half of that just ran through into the drip tray. Here's my veg tent in April. Of note, the plants are reasonably healthy. Last feeding was at 50% strength, July 27. Watered again on the 30th, and then waited 12 days to water again. It's hard to tell if it's worse or better than the Space Candy above. So, adjusting pH might be making things better, or at least doesn't seem to make things worse. Here's a Conspiracy Kush in Coast of Maine Stonington's Blend soil + 25% perlite. I'm loving this soil for flower, by the way. Was loving it in veg, too, until a week go. Oh look, weird yellowing like the bottle-fed girls. 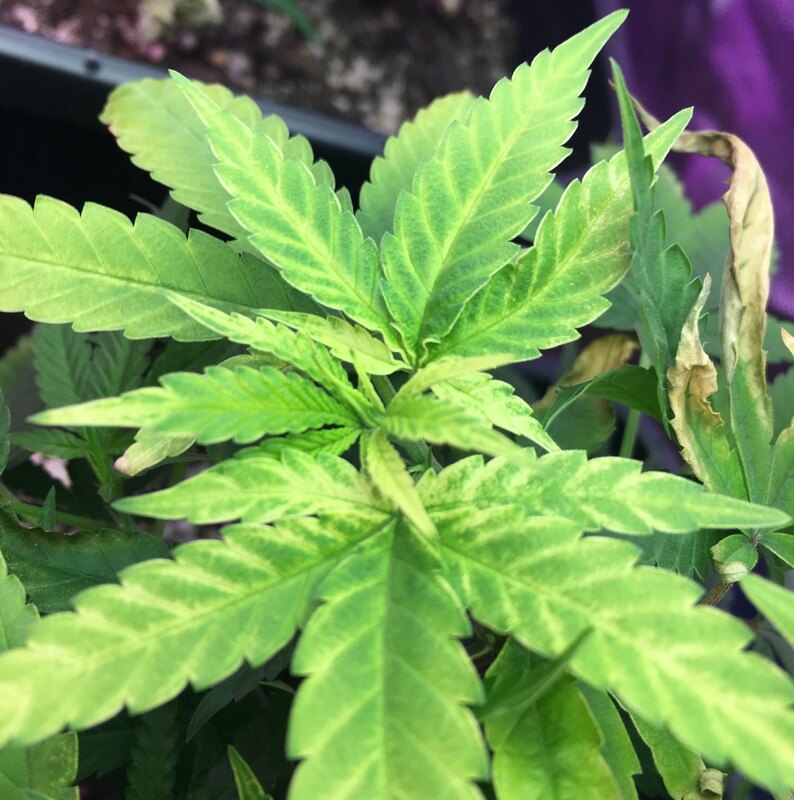 This plant has received only RO or distilled water, with a dash of CaMg+ for remineralization. Was growing better than the others, but has now slowed to a crawl and stopped drinking. So maybe not the nutes, and maybe not the soil. I'm must be overwatering, or at least I need to get more air to my roots/soil so they dry out faster. My Wreckage mum in Ocean Forest + 25% perlite in a smart pot. That green growth isn't actually new: it's the inner branches that have been hidden by dying growth tips. I think I only went 9 days between watering with this one. In a smart pot. Nine days. Conspiracy Kush, the mum (dad?) for the super soil plant above, and in the same soil mix as the super-bleached CK. But at this point, it's kinda healthy? This one has been living in my flower tent for 18 days to make extra sure it's a male, and yeah. It is. Has been watered maybe every 6 days with RO + CaMg drops, spraying soil surface every-so-often with the same. That dying leaf in the lower-right is one of the old bleached leaves from the veg tent, because it was in as bad shape as everything else. Soil seems to be capable of growing a plant, water does not seem to be poison. Good news, I guess, but doesn't help me solve my veg tent problems. So flower tent can sustain life: it has a 150w HPS + 315w CMH, and a good amount of airflow and ventilation. My veg tent has 150w LED + 96w T5s, no change in light/ventilation from When It Worked, however. Don't think T5s on 18/6 would need to be replaced after 8 months, but guess I can give that a shot... and if that doesn't work, I have no idea where to go from here. Alright, vent complete. If someone can remove the gypsy curse from my veg box, it would be most appreciated. It would be crazy but it has happened. Check your LED and see if all the diodes are working. 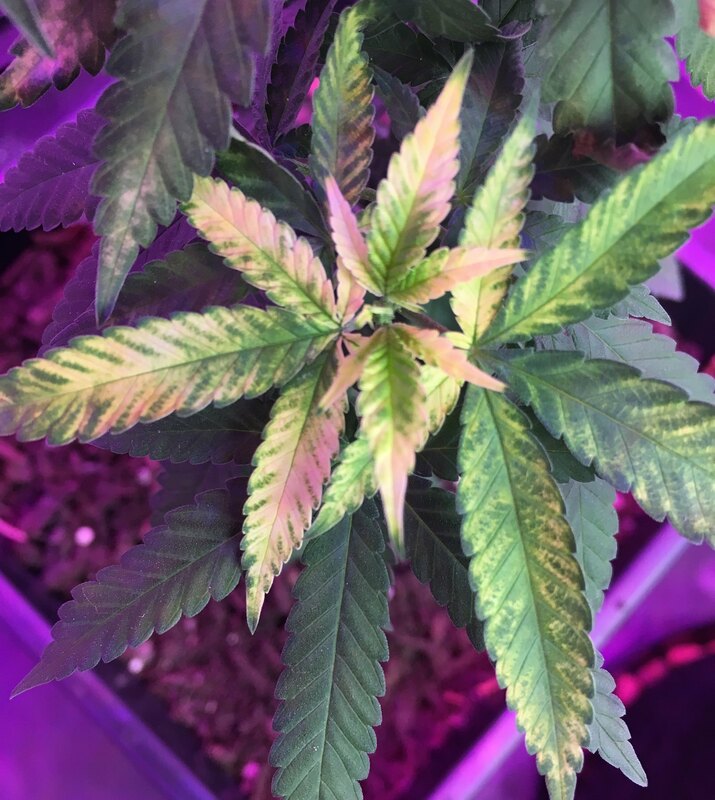 You might be getting wierd spectrum causing weird growth. Did i understand the flower tent is good. We have gone over most stuff already so i am just brainstorming. Yep, flower tent is mostly good Before I flipped the current batch to 12/12, I vegged for a month on 18/6 to nurse them back to health. This helped a lot, but does not make up for several weeks of unhealthy veg growth. Diodes on the LED are all lit and retina-burning. I did just take a trip to yee olde hydroponic shoppe to pick up fresh T5 bulbs -- I remembered that my seedling fixture was the one that got new bulbs this year, and my veg fixture's bulbs had probably been used for 16 months or so. Oops. Also took this opportunity to write down bulb replacement dates for all of my fixtures. 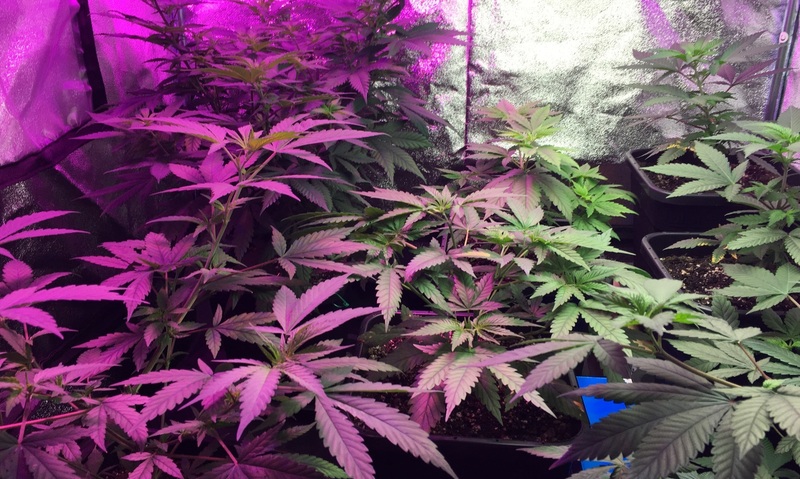 LED have lower heat than the lights the nutrient company is likely using. Typically need less food and water . Full strength feeding combined with Roots mix/ocean forest. Both have enough to go pretty much just on the amendments in the mix for at least a couple of weeks. Switch to plain water and water less often. See if that can get them to green up. so you changed nothing in your soil and ferts regime and things spontaneously went bad? Strange. I would be getting the water tested for ph and maybe a general lab test (I like KAR labs). The only thing that jumps out at me is your statement that you hadn't watered some plants in 8-12 days. That doesn't sound good. 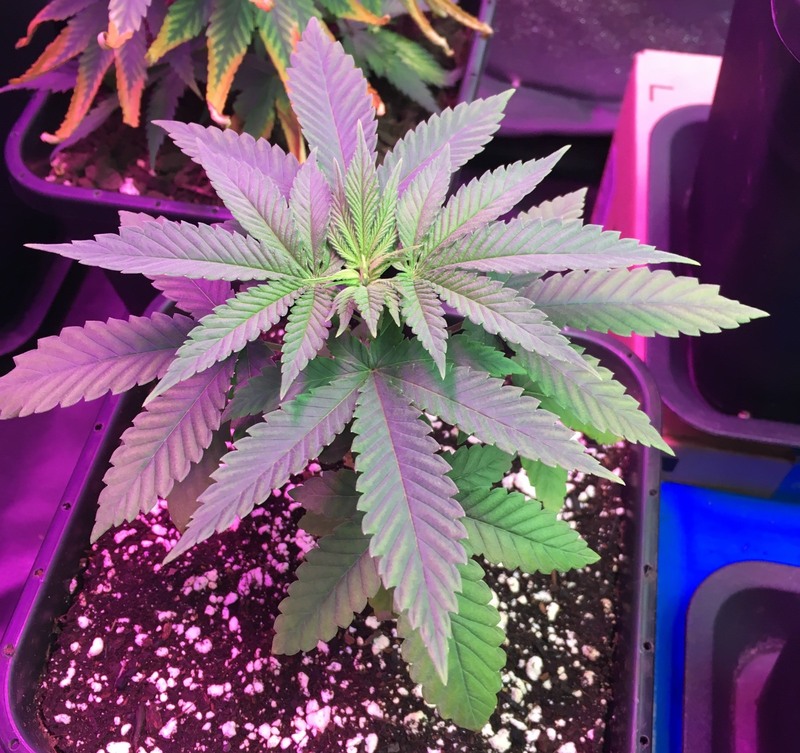 Even when I transplant from a 2 gallon container to a 5 gallon I'm usually watering within 3-4 days. During veg I'm usually watering every 2-3 days. If they didn't need water after 5 days the soil mix must be too heavy. PS, I've also have bad results when mixing light spectrums, for that reason I don't like the look of tent with one side white & one blurple. I would use the same specturm or blend the lights so the whole canopy gets approximately the same spectrum. I had all sorts of weird growth when I mixed some purple LEDs with my HPS a few years ago. Still, not as bad as leaves curling up and dying, looks like someone poured bleach into the soil. 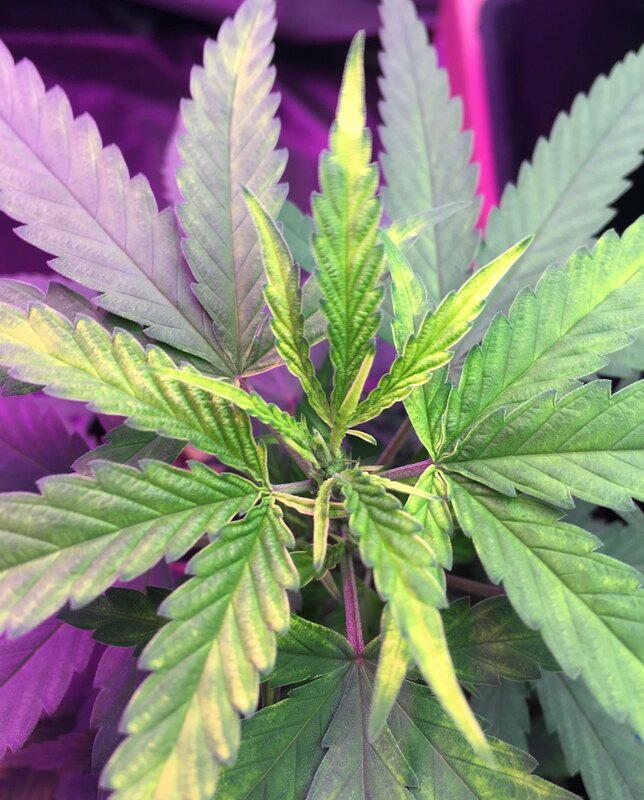 I have blended spectrums for a long time led and flouros/hps with no ill effects. If you get runoff with small quantities of water, your pots are waterlogged. If they stay waterlogged the plant won't eat, and will look like it does. Your environment is in check from your description. When troubleshooting it can help to raise the lights and just let it dry out without feeding or water. Wait until its bone dry to water plain water. Could help. It's soil. Not much can go wrong but food water or environment. so you changed nothing in your soil and ferts regime and things spontaneously went bad? Changed to RO filter from carbon block filter, though I also bought a lot of Poland Springs. Fun fact: some frat bros taunted me about the apocalypse when I was buying a shopping cart of big water jugs at the grocery store. But I digress: I don't think it's the water, but I've also tried spring water (same apocalypse shopping trip, even), and did not notice any differences. Full strength feeding combined with Roots mix/ocean forest. Both have enough to go pretty much just on the amendments in the mix for at least a couple of weeks. Yup, acknowledged. 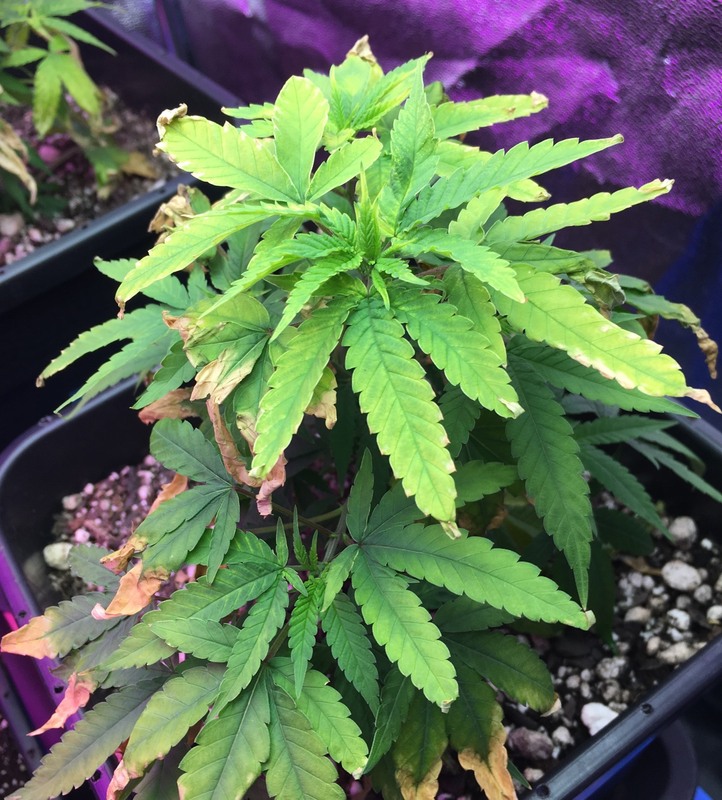 I haven't been giving them full-strength nutrients, and was avoiding feeding the OC plant until it showed some N deficiency. I'm holding way back on feeding (and watering) right now, waiting for a sign that these plants respond to... something. Anything. If they didn't need water after 5 days the soil mix must be too heavy. Yep. I thought that 25% perlite was fine. I was using 20% perlite with Happy Frog in the winter with good results. But when I think "heavy soil," I think crap drainage... and all of them drain quite freely when watered. Is my understanding of heavy soil too outdoor-oriented? Oh. I just remembered another change: the perlite I'm using now is finer than my last stuff. The stuff I used in the winter was coarse, probably like 5mm in diameter, stuff I have now is probably closer to 2mm. Could finer perlite cause soggy feet? I've got clay pebbles in the bottoms of the pots, too, so the bottoms shouldn't be completely waterlogged. If you get runoff with small quantities of water, your pots are waterlogged. If they stay waterlogged the plant won't eat, and will look like it does. Which is pretty much my direction of thinking, and why I was doing my best to wait until the plants wilt in order to water them. However, the top is dry -- like as far as my finger reaches is dry, never mind the top inch. But yeah, 12 days, no wilting. There's water in there somewhere. That's actually pretty funny about the water jugs. I've been the guy buying dirt and ducting and I did a few water runs when I did hydro and didn't haved an RO unit. Weird looks at times. Is the veg tent a different brand than the flower tent? I have seen something similar once with a friends grow. It turned out the plastic the tent was made from was toxic. Very similar symptoms. I have read through this thread, and have to admit that I am somewhat mystified. I have never used grow-tents of any type. There is something decidedly weird going on with the unfortunate plants inhabiting your veg. grow tent. I would try pure water only when needed (it seems like you are absolutely not overwatering), and begin foliar feeding only with a different brand of a balanced fertilizer. I am somewhat saddened that I am proscribed from physically attending to your plants in order to assist you. Pictures and the internet have certain limitations. Good luck resolving this intriguing conundrum! good idea - if the damage affects only the higher tops it could be light burn. 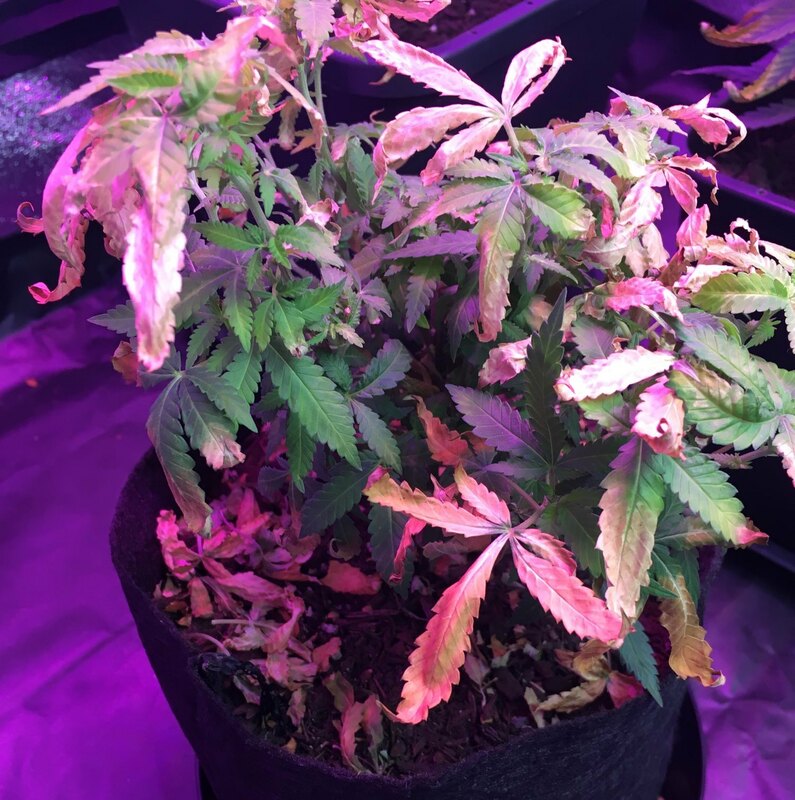 as I posted above, I have burned and shocked my plants by changing spectrums on them and/or hanging the LED too close, combining different light spectra, etc. Whatss up man you still not having success with those seedlings ?? ... yeah I am filled with shame. Anyway. Looking at my notes from winter/spring, I was using the same size 5L pots, Happy Frog soil + 20% perlite, giving 250mL nutrient solution every 3-5 days for the first couple weeks in those pots, eventually working up to 1L every 3 days. I'm using a little more perlite right now, but have watered 250mL total across 5 plants in the month of August. good idea - if the damage affects only the higher tops it could be light burn. Seems to impact both the T5 side and the LED side, and the bleaching impacts any active growth tips. I think I have the LED light at a safe distance (learned about LED burn the hard way with my first post-legalization seedlings), and it remains at the same height as it was for healthy plants. Anyway. Working theory: overwatering (or at least wet feet), leading to unhealthy root system + nutrient lock-out. As I'm starting to see hints of recovery, I'll hopefully have some not-shameful vegging plants in a few weeks. Alternatively, I'll have dead plants and can cross off "overwatering" from the list of possible causes? I've got backup beans for everything in there aside from the Wreckage, so would be sad but not the end of the world. I've never seen light burn cause that much damage by itself. now you've got me scared I'm starting some expensive seeds today, I was going to make a few changes to my soil mix, but maybe I should use exactly what worked last time. I got a free bag of "Ancient Forest", I was going to add some but it's pure compost, I'd have to decrease the share of other compost like worm casting or things could get water-logged. now you've got me scared I'm starting some expensive seeds today, I was going to make a few changes to my soil mix, but maybe I should use exactly what worked last time. I think the gypsy curse is localized and other Massholes are safe You certainly have better intuition about when your plants need water, I'm still getting my green thumb back when it comes to fast-growing annuals. Also, not to encourage you to go off topic, but what precious beans are you germinating? 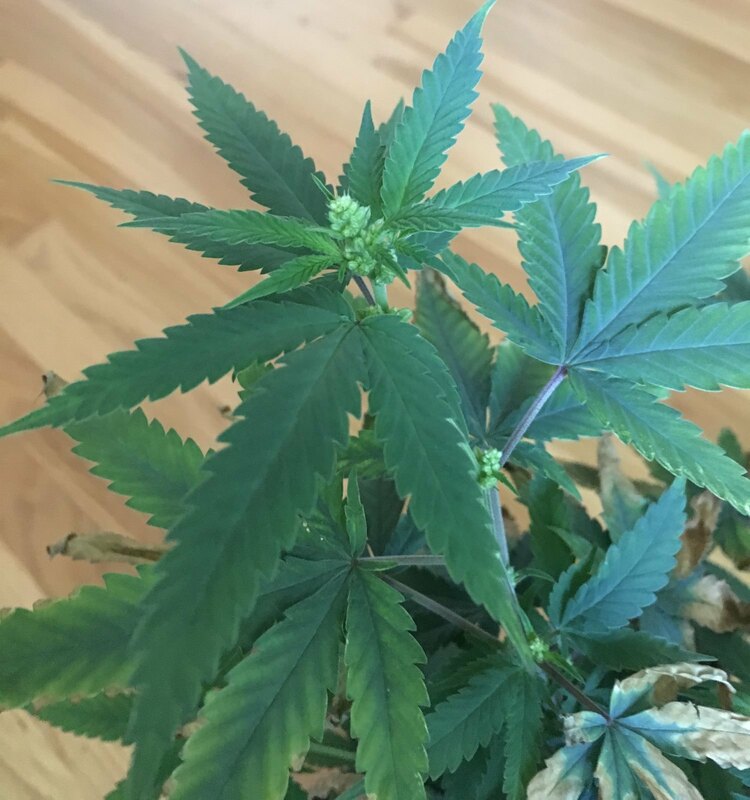 I have a pack from Dynasty Seeds - Oregon Huckleberry X Girl Scout Cookies. It's cool, they give you 13 seeds, I just opened it. I'll get some photos of the seedlings.